Americans are getting heavier and heavier. This 2009-2010 National Institutes of Health survey shows that more than two out of three Americans are either overweight or obese. Here is our list of top 10 veggies for weight loss to help you and the rest of Americans get healthier. These statistics are shocking. And it’s no wonder that this leads to many people wanting to lose weight. One habit that can help in this endeavor is to simply increase your consumption of vegetables. Research has shown that eating more veggies can result in steady weight loss. But don’t reach for the corn and baked potatoes just yet. The type of vegetables consumed plays a large role in whether they help or hinder your weight loss. 1 Some vegetables help you lose weight; some don’t. 3 Simply adding vegetables to your diet won’t work. Some vegetables help you lose weight; some don’t. In a study that followed participants over a 24-year period, researchers found that people who stuck to eating high-fiber, low-glycemic load vegetables such as broccoli and Brussels sprouts enjoyed better weight loss. Those people who ate starchy vegetables like corn and peas actually ended up gaining weight. Another, shorter study tracking participants for 12 months also found a correlation between vegetable intake and weight loss. Vegetables help keep you full longer. The vegetables associated with weight loss are packed with fiber and water. These work together to help you feel full sooner and longer. Vegetables help prevent fluctuations in blood sugar. Thanks to their fiber content, vegetables help keep your blood sugar steady, helping to keep your energy levels up and preventing a slump that might cause you to crave something sugary. I don’t know about you, but if I miss a meal, I want nothing more than a mountain of doughnuts. Vegetables are low in calories. The vegetables that help you lose weight are low in calories when compared to their volume and nutrient content. A cup of salad has 11 calories. Eleven! You would have to eat 19 cups of salad to equal the number of calories in an average candy bar. Leafy greens include anything that is, well, green and leafy. My favorites are red leaf lettuce, collards, spinach, and kale. They are incredibly nutritious and will add a lot of bulk to your diet plan without adding many calories. They are also high in calcium, which can aid in fat burning as this study If you’ve tried one leafy green and weren’t impressed, don’t give up. There is such a variety in this family of vegetables that you’re bound to find something you like. Not everyone can be a fan of kale! If you prefer milder flavors, try a dark lettuce in your salad with a few spinach leaves mixed in. Cruciferous vegetables are a large family of over 30 vegetables. The most common ones include cabbage, cauliflower, Brussels sprouts, kale, and broccoli. Compared to other vegetables, they are reasonably high in protein, making them a good choice when wanting to feel full longer. As with all the vegetables in this list, they are also high in fiber and water. Cruciferous vegetables have the added bonus of having a clear correlation with cancer prevention. Turns out mom was right about broccoli being really good for you! With cucumbers being 96.7% water, it’s no surprise that they are a great weight-loss food. Because of their high water content, cucumbers serve as a natural diuretic—great news if some of your excess weight is due to water retention. They are delicious in a salad or dipped in hummus for a satisfying and filling snack on the go. You can even add some sliced cucumber to your water to make it more refreshing, especially if you’re having trouble drinking enough. Like cucumbers, asparagus has diuretic properties, making it a great choice for weight loss. It is also high in water and has a reasonable amount of protein. Most notably, it contains inulin, a type of fiber which isn’t digested until it reaches the large intestine, where it helps to absorb nutrients better. A great way to prepare this delicious vegetable is to lightly sauté in in olive oil with a bit of salt and pepper. Add some sliced almonds for a fancy-looking dish that’s easy to prepare! Like cucumbers, bell peppers are very high in water content at 92%. Furthermore, this site reports that bell peppers are incredibly high in vitamin C which counteracts the body’s production of stress hormones associated with increased fat around the midsection. They’re versatile and taste great raw or cooked. This incredibly low-calorie content coupled with a high fiber and water content makes celery a great weight loss vegetable. High in folate and vitamins A, C, and K, it’s also quite versatile: Cut it into sticks and enjoy with your favorite healthy dip, or chop and add to your soup or stew. Depending on where you live, it might be difficult to find good quality fresh artichokes. If you happen upon some, grab them because they are an amazing vegetable! One medium artichoke has a whopping ten grams of fiber which will help keep you full for a long time. 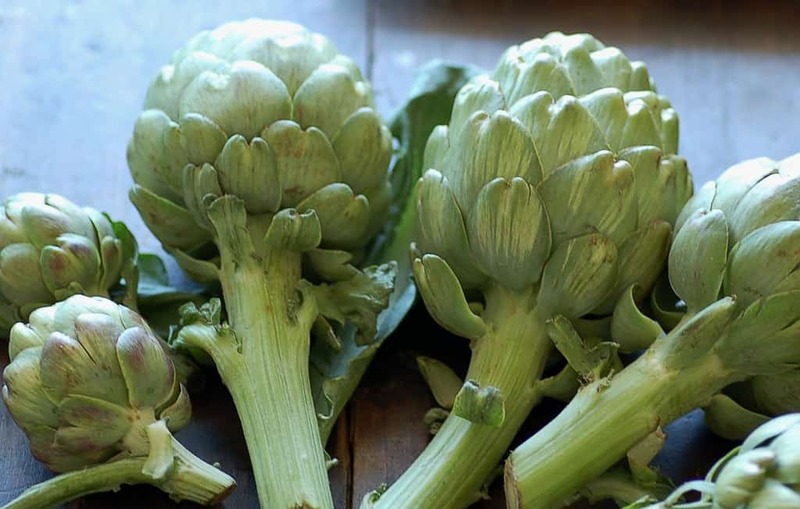 Artichokes also have a variety of other health benefits including improved liver function, improved digestion, lowered blood cholesterol levels, lowered blood pressure, improved bone health, and cancer prevention. You just can’t go wrong with artichokes! If you’re trying to lose weight, skip the melted butter when eating them. Instead, opt for steamed artichokes with a bit of sea salt and a sprinkling of lemon juice. Not surprisingly, onions are also very high in water. But did you know they contain a substance called quercetin? Quercetin aids in their ability to help you lose weight because it helps keep new fat cells from forming. It also activates a protein that helps keep blood glucose levels stable, keeping you full longer and preventing those slumps that make you want to wolf down a dozen bacon cheeseburgers and maybe a doughnut or two … or eight. Onions—as well as garlic and other members of the allium family—also contain a compound called allicin which triggers the satiety center in the brain. Eating them literally helps tell your brain that you’re full! Chili peppers are my all-time favorite weight loss vegetable. They add so much flavor to any dish. I was thrilled when I learned that they also help with weight loss. Chili peppers’ spicy flavor comes from capsaicin, a substance that has been proven to decrease appetite and burn fat. You can even buy capsaicin as a supplement, but I’d rather eat it in its original form. Mushrooms are about 90% water and 100% flavor. (I did the math.) Science even says so. They contain an ingredient called glutamic acid which is a building block of MSG (monosodium glutamate). This makes them a great choice when you’re looking to enhance the flavor of your dish without adding too much salt. Simply adding vegetables to your diet won’t work. One key thing to remember if you’re trying to lose weight by incorporating more vegetables into your diet is that the total number of calories you consume makes a difference. This study found that simply adding more vegetables to your diet won’t result in weight loss. The key is to replace other foods in your diet with vegetables, thereby decreasing your overall caloric intake. If you’re having a difficult time incorporating more vegetables in your diet, consider making them your main dish at supper time as opposed to a side dish. As you become accustomed to seeing larger portions of vegetables on your plate, it will become the norm for you.